Major General James Birdseye McPherson was a man who defied some of life's greatest odds. Born in 1828, near Clyde, Ohio, he was the son of a mentally unstable blacksmith who was later declared incompetent. In order to help make ends meet, young McPherson took a job in a local store. While working, he was taken under the wings of the store owner who recognized young McPherson's mental aptitude. With his guidance, McPherson won an appointment to enter the United States Military Academy at West Point. McPherson had come a long way from a meager childhood to the nation's most prestigious military academy. As a testament to his tenacity, he managed to graduate first out of fifty-two students in his class. By the age of twenty-four, as McPherson left the military academy, he had changed what would have been a humble destiny. In 1862, ten years after graduating from West Point, he was chosen by U.S. Grant as his Chief Military Engineer. The position eventually led him to the battlefield at Corinth, Mississippi, where he commanded an infantry brigade. His next appointment would be to lead the Union's 17th Corps during the campaign to capture Vicksburg. May 12, 1863, found the thirty-five-year-old general leading a corps of 12,000 men as they marched toward the outskirts of Raymond. McPherson's participation in the Battle of Raymond represented a first for him. It was his first time to be the commanding officer in charge of a military campaign. Displayed on the shoulder of his uniform were his general stars that had been sewn into place by Mrs. U. S. Grant. The Battle of Raymond proved to be one of the most challenging battles for McPherson during his career with the Union Army. After a rugged start, he finally pulled out the victory. Military historians agree that the Battle of Raymond was won not by military strategy but due to the overwhelming size of the Union Army. During the Vicksburg Campaign, McPherson requested a leave of absence from his military post in order to marry his fiancée, Emily Hoffman. Sherman denied the request. Obviously, the Union Army felt McPherson was too valuable to lose, even for a short time. After Vicksburg, the illustrious career of the young military genius was short-lived. One year later, on July 22, 1864, McPherson, at the age of thirty-six, was killed during the Atlanta Campaign as he rode into enemy skirmishers, under the command of General John Bell Hood, a former classmate of McPherson at West Point.. As he attempted retreat back toward his command, the enemy yelled, "Surrender!" When McPherson attempted to flee, he was killed. The next day, Maj. General Oliver Howard, wrote in his report, "We were all made sad yesterday by the death of General McPherson - so young, so noble, so promising, already commanding a department! His death occasioned a profound sense of loss, a feeling that his place can never be completely filled. How valuable, how precious the country to us all, who have paid for its preservation such a price." 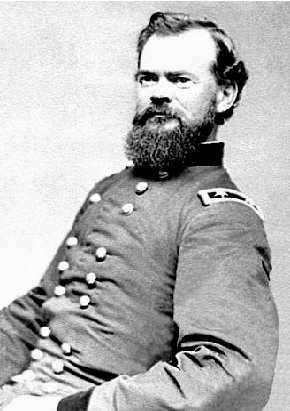 Upon hearing the news, General Sherman wept openly until tears dripped from his unkempt beard. He felt pangs of guilt for having denied McPherson's request for a furlough to be married. And, he felt tremendous grief over the sudden loss of such a friend. In Sherman's official war report he stated, "The country generally will realize that we have lost not only an able military leader, but a man who, had he survived, was qualified to heal the national strife which has been raised by designing and ambitious men." In a letter to his wife, the bereaved Sherman wrote, "McPherson's death was a great loss to me. I depended much on him."